The Isle of Skye has always been seen as a magical place. Along with the beautiful landscape there are plenty of myths and legends to stimulate your imagination. With the landscape it’s easy to believe these stories. 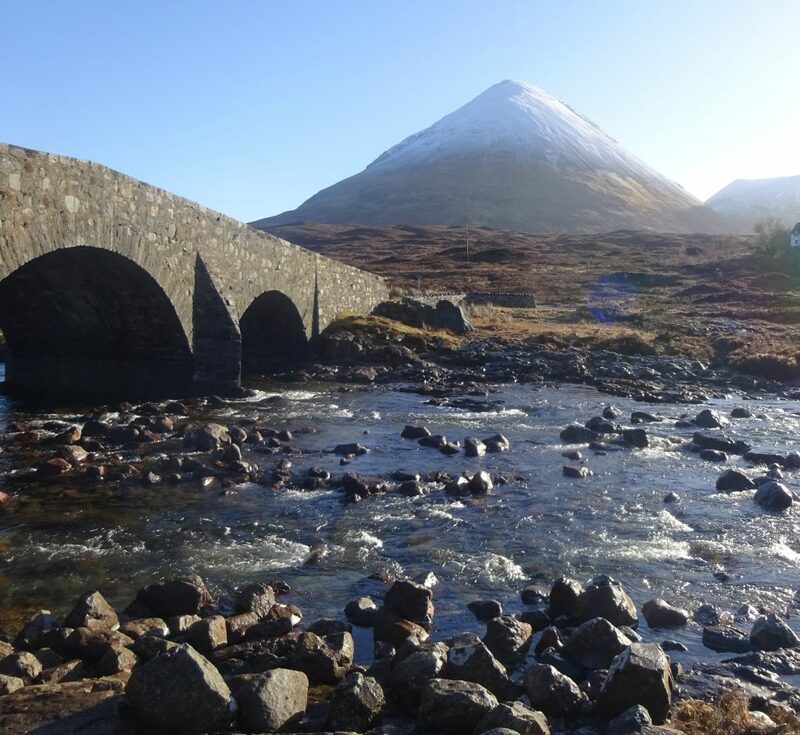 The Sligachan Bridge has a great tale, and what’s more you can gain eternal beauty from the waters below the bridge. The Sligachan Bridge is on the main road to Portree, in the heart of the Cuillins. Park at the Sligachan Hotel and make your way across the road to the left of the hotel to the bridge. If you’re parking at the hotel I would obviously advise you not to be too cheeky and at least have a coffee as you’re using their facilities. Clamber down the rocks on the right hand side of the bridge to reach the enchanted faerie waters. Now for my favourite part! The story behind the enchanted waters that run through the river below the bridge. There are actually two legends to the waters. I will tell the one that I was told on my Macbackpackers tour, as it is the only one I have heard from a Scotsman. Many years ago, on the Isle of Skye, there lived the greatest warrior woman of Scotland, Scáthach. Word of her greatness spread everywhere and one day it reached the ears of the greatest warrior of Ireland, Cúchulainn. Cúchulainn knew that he must go and fight this warrior woman of Scotland to prove that he is better. So he set sail for the Isle of Skye. Arriving on Skye, Cúchulainn came across a trainee of Scáthach and demanded that her mistress should come and face him. Scáthach came to meet him to battle and prove which one was strongest. They fought and they fought. Their battle raged through the whole of the valley, shaking the earth. Animals fled before them, such was their ferocity! As they battled Scáthachs daughter ran down to the river and cried. She could not see how her mother could win. As everyone knows, water allows a gateway between the faerie world and ours. Some of the faeries heard the cries of Scáthachs daughter and came to her. They told her to wash her face in the water of the river. She followed the faeries advice and was filled with the knowledge of how to stop the battle! She ran back home to the lodge where her mother lived. Along the way she gathered herbs and nuts. Arriving at the lodge, she threw the nuts and herbs in onto the fire and fanned the smoke into the valley. Upon smelling the scent upon the smoke both warriors realised just how tired and hungry they were from the fighting, so they laid down their weapons and headed to the lodge. Arriving at the lodge they were greeted by Scáthachs daughter who had prepared a meal worthy of two such mighty warriors. As Cúchulainn ate under the roof of Scáthach, he became her guest and as such they could do each other no harm. Legend has it that if you dip your face in the river water by the Sligachan Bridge, you will be granted eternal beauty. The phrase ‘eternal beauty’ is a strange one. Why did Scáthachs daughter get knowledge and now you can gain beauty? Is it because beauty is more than skin deep? Is ‘beauty’ open to interpretation? Whatever you believe, it is important that you wash your face the correct way to gain the beauty. 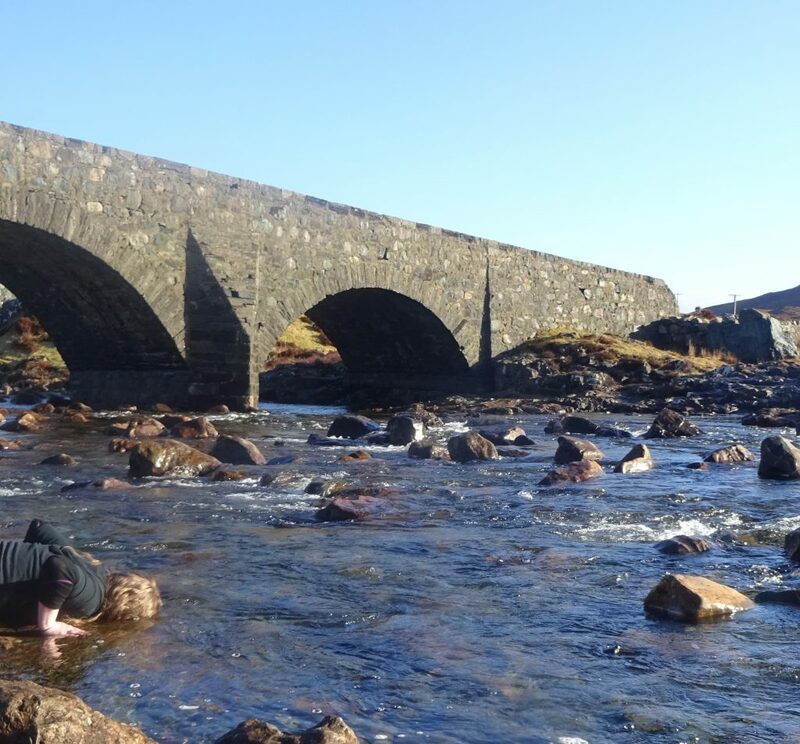 After getting to the river bank by the Sligachan bridge, washing your face is not a simple as it sounds! You must dip your face in the water, not bring the water up to your face. To do this you must get on your hands and knees at the water’s edge and fully submerge your face for seven seconds. Be warned, it is Scotland, the water is far from warm! Also, you can not wipe the water off, you must allow your face to dry naturally! Now you have eternal beauty! Whether you believe in myths or not, the Sligachan Bridge is a great viewpoint. In the heart of the Cuillins it is a beautiful part of Skye. I would encourage you to dip your face in the river whether you believe or not, experience everything and you never know, you may become a believer! Want to visit? You can search for nearby accommodation on Tripadvisor. I did this May 13, 2018 and it was invigorating to say the least. I could only stay under 4 seconds so I guess I’m stuck with my 60 ish face ! I think invigorating is definitely the word to use! Fantastic story and a great retelling. Thank you. The actual story says it happened at Scathachs fortress in the south. The daughter prepared three meals to try and tempt them to stop fighting on three consecutive days. The thrid day both parties were tempted by the hazels of knowledge – each thought eating them would let them know how to end the battle to their advantage. It worked. They both realised that neither could win – they were evenly matched. So they became allies. Thanks for that! It’s amazing how many versions of these old legends there are in the world. I guess it’s because they were originally shared through word of mouth. 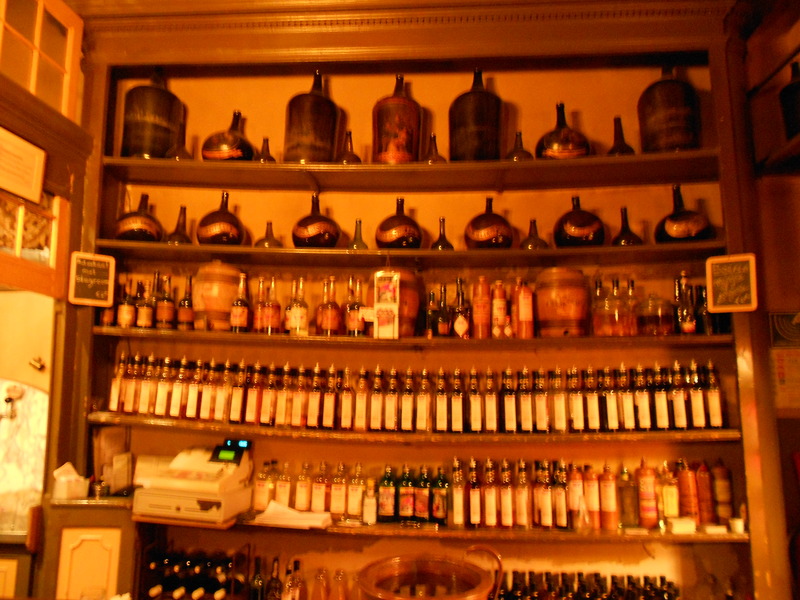 A Tasting Tavern in Amsterdam, the Wynand Fockink is a great place to absorb some history! 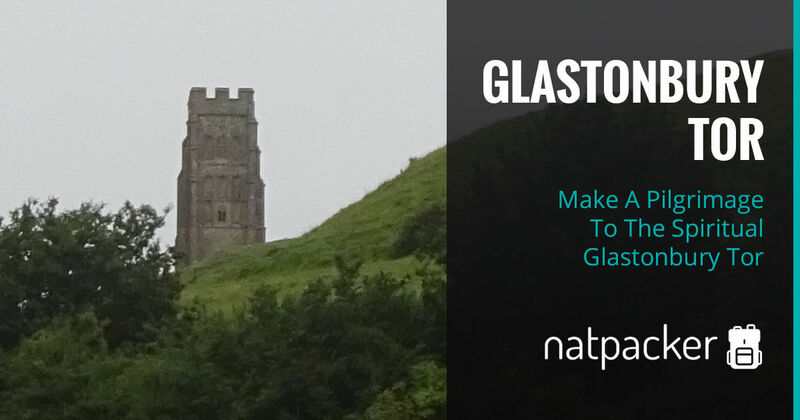 Glastonbury Tor is a historic site shrouded in mystery and myth.